In assembly this week, we followed on with our recent theme of Jewish celebrations by looking at the festival of Sukkot. Sukkot is a 7 day Jewish holiday celebrated 5 days after Yom Kippur. Traditionally, Jewish farmers would stay in a 'sukkah' on the edge of their fields whilst they completed the harvest. 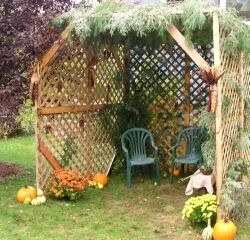 A sukkah is a hand-made shelter (usually made of tree branches) which must have at least three sides. The roof is meant to protect people from the sun's rays, but not be waterproof. It is also how Jews remember their time in the wilderness following their escape from Egypt. Many families have their meals in a sukkah. It is a joyous occasion and is often referred to as the 'Season of our Rejoicing'.